President Yoweri Kaguta Museveni has quizzed the cause of the new Tourism strategy of ‘curvy pageant’ to promote Tourism noting that Tourism should not be about the looks of a woman. He says it’s inappropriate method undertaken by the Ministry in promoting Tourism because Ugandan women are not tourism objects, adding that ‘Miss Curvy’ organisers need to be guided on what direction to follow. Museveni was at a launch of the 6 investors Roundtable at State House Entebbe where he promised to block exportation of any raw material. He further stated that if he could rewind the clock, he would not congratulate Abenakyo’s engagement in the Miss World contest, stating that it might be the reason this project was arranged. This came after a launch of ‘Miss Curvy’ contest by Godfrey Kiwanda Ssuubi, State Minister for Tourism who is now under fire over the project. Minister Kiwanda during the launch of his project said that Ugandan women some of them are well built with nice shapes, which can attract tourists. While at the launch Mahmood Hudda an investor in the Agriculture sector said the ministry is sleeping instead of rendering services to enhance growth of the sector. Kibazanga added that Ugandans who are against the use of science and technology in the sector are the reason why it has retarded. A response Museveni went silent on. 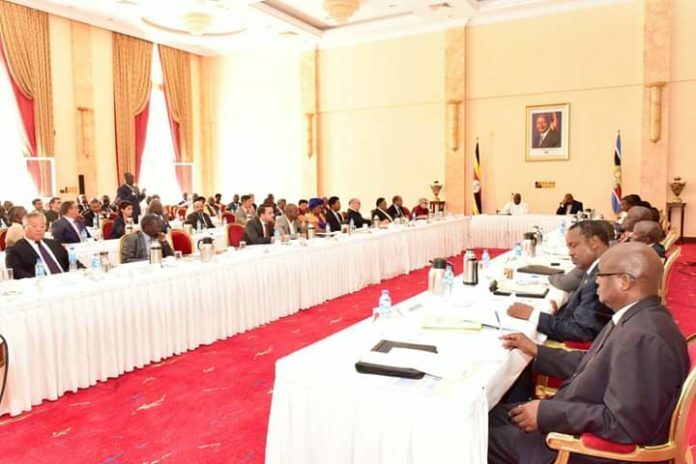 There after Agriculture, Tourism, Oil and Gas, mineral value addition, transport were launched by president Museveni as one of the six presidential investors Round Table systematic areas to focus on. “Despite of the confusion by the Technical people, and to some extent also, some of the political elements. The Agriculture sector is growing not very fast but reasonably well.” President Museveni said.